First Gaufest! About 1200 people attended. Preisplatteln was held on Saturday after the banquet. 19 Vereine participated. Gaufest First: Introduction of the "Gauplattler" on Sunday; it would be adopted as the Gauverband's official Plattler the next day. Steve Stampf wrote the music; Martin Hubner of Die Gemuetlichen Enzianer developed the Plattler. A Delegates Meeting was held on Monday (Memorial Day) and the Gaufest concluded that evening. The Weitpreis Pokal was given to the Gauverband by Lufthansa Airlines at Alpenland Montreal's Fahnenweihe in 1966. 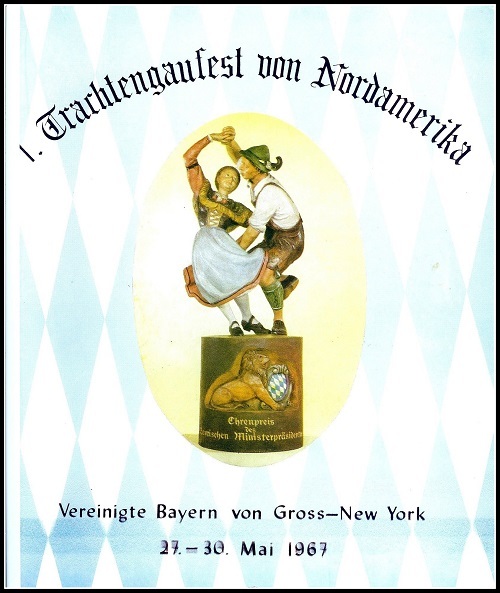 To start the Weitpreis into circulation, D'Holzhacker Buam Milwaukee was the first Verein to receive it. They returned it at the 1. Gaufest, where it was awarded to TEV Edelweiss Denver for having traveled farthest. The handcarved Wanderpreis, awarded to the first place Preisplatteln group, was donated by the Bavarian government.